SAN LUIS OBISPO, Calif. — “Celebrating the Mustang Legacy” is the theme of Cal Poly’s 2016 Open House that will bring current and prospective students, their supporters, faculty and the San Luis Obispo community to the campus from April 14-16. The 23rd annual event, which showcases the university and its six colleges, celebrates the achievements of past and current Mustangs. It will give prospective students an opportunity to participate in campus traditions and display school spirit in advance of their time at Cal Poly. Activities include a parade, preview day, annual showcase of student clubs and a slate of performances by various campus groups over three days. On Thursday, April 14, the Open House Committee kicks off the weekend with Club Preview Night at the Downtown SLO Farmers’ Market. 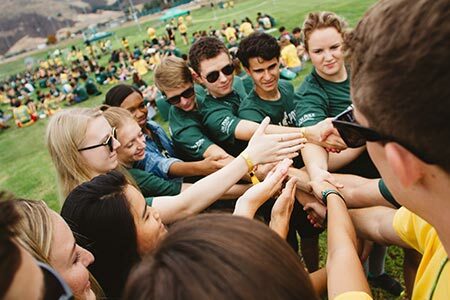 Admitted Students’ Preview Day, set for Friday, April 15, allows students who will start in September and their families to get acquainted with academic life at Cal Poly and the Learn by Doing ethos. Students will be encouraged to start thinking about their course of study as they learn about curriculum, hear from college deans, and meet faculty and current students. On Saturday, April 16, Cal Poly will host a campuswide open house to visitors and the community featuring a student parade and booths from the more than 200 student clubs and organizations and demonstrate Learn by Doing in action. 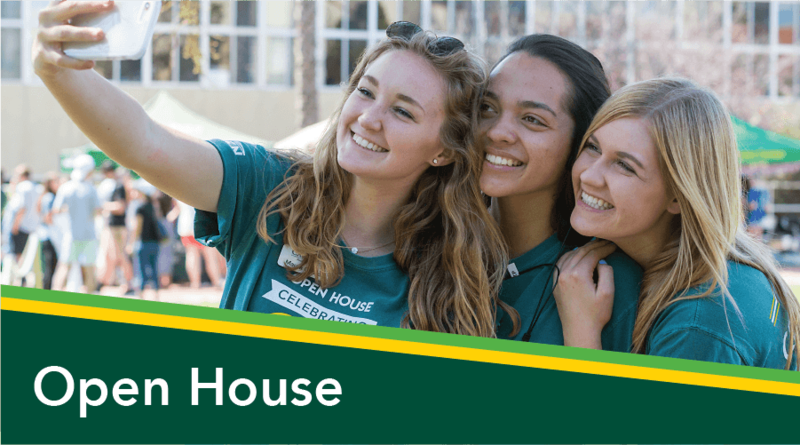 Open House fosters relationships with community members, local businesses, departments, and student groups so that every prospective student will have access to the resources that fosters success while attending Cal Poly. For more information about Open House, contact Nate Alcorn, program coordinator for New Student & Transition Programs, at 805-756-2057 or nalcorn@calpoly.edu. SAN LUIS OBISPO - Cal Poly New Student Programs has announced changes to its summer orientation programming. This summer, new students and their families will experience "Explore SLO", which replaces the annual Week of Welcome SLO Bound event. 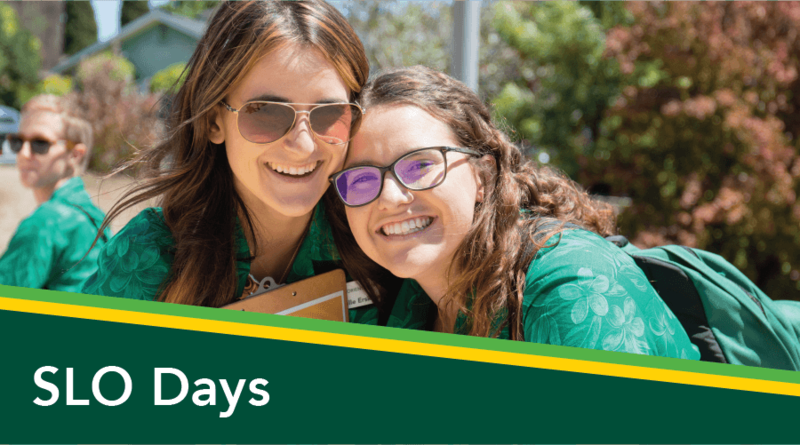 Traditionally during SLO Bound, 4,000 new students and their WOW leaders travel throughout downtown San Luis Obispo during a single day, to introduce the students to their community. To broaden the experience and include parents and families, the spotlight will now be on downtown San Luis Obispo in the summer. 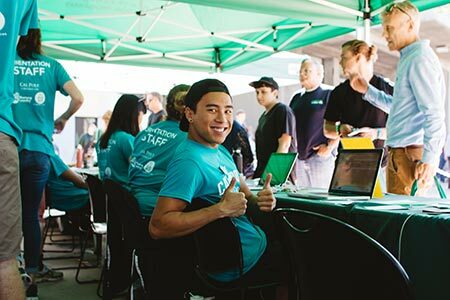 During Cal Poly's summer orientation program, Soar, participants will be transported downtown in the afternoon and evening in two groups of about 500 people, exploring downtown from noon-3 p.m. or 4-7 p.m. Participants will enjoy a meal, explore shopping and resources, and discover their new surroundings. Offering exclusive discounts and special offers to all Soar participants, San Luis Obispo business owners are thrilled at the opportunity to interact with new students and their families in a more intimate way. Participating businesses include: Apple Farm Inn, Café Roma, Dr. Cain's Comics and Games, Enzo's East Coat Eatery, F. McLintocks, Jamba Juice, Petra Mediterranean Pizza and Grill, Pizza Solo, SLO Brewing Co., Spike's, Splash Café, Vieni Vai Trattoria, Woodstock's Pizzeria, and Yogurt Creations. For more information, contact Jason Mockford, coordinator of Cal Poly's New Student Programs, at 805-756-2477 or jmockfor@calpoly.edu. SAN LUIS OBISPO, CA --- On May 28th at 6pm, a team of students from Cal Poly will collaborate to produce a live web show that is geared toward incoming students and their supporters. Poly Live! occurs twice a month during the summer months of June, July, and August. The goal of Poly Live! is to help transition incoming students after Open House is over, and before WOW takes place. This web show is able help ease students through the summer, when they have a lot of questions and can feel nervous about coming to college life. The purpose of Poly Live! is to answer as many of the students questions as possible in order for them to feel confident when they walk down the Mustang Way in the Fall. These shows are structured so incoming students can ask questions using a chat system. Once a question is asked, a panel of current students can instantly respond with accurate resources and information. Poly Live! is a great opportunity to learn about resources on campus and become a part of the Mustang family before the first day of their college career begins. Archived videos are available on the Poly Live! website, allowing students and supporters to view what has been discussed over the past seasons. In past seasons, there have been appearances made by the Associated Students Incorporated President, the President of the University, and the Vice President of Student Affairs. Information regarding student clubs and organizations, the Health Center, the Disability Resource Center and much more has also been featured on Poly Live! For more information, contact Jason Mockford, coordinator of Cal Poly’s New Student Programs, at 805-756-2477 or jmockfor@calpoly.edu. 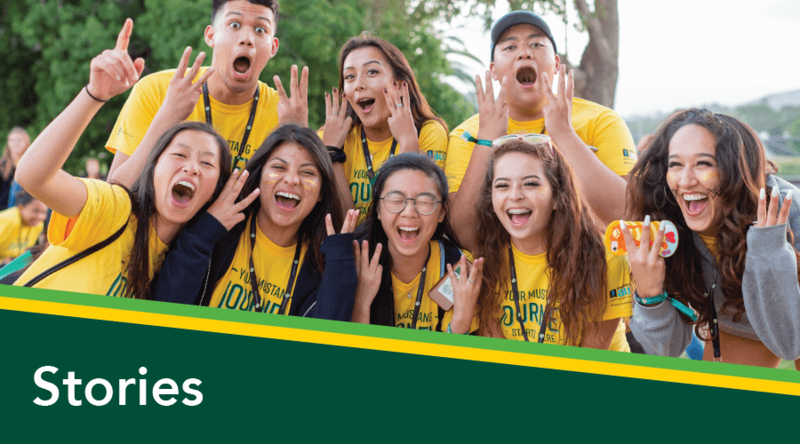 SAN LUIS OBISPO, CA --- New students will continue their transition into college during this summer with Cal Poly’s summer orientation program, Soar. Soar is a program designed for all incoming students, their families and supporters. There are three different types of Soar sessions that last for about a day and a half during July and August: first year sessions, transfer sessions, National and International student sessions. All programs are unique and designed to help acclimate students academically to the Mustang family. The Soar staff is comprised of current Cal Poly students that will be leading the incoming students and supporters during their Soar session. These students were trained during this season’s Spring Training, and have learned a variety of skills and resources through their 20+ hours of training in order to prepare students and supporters for their Cal Poly experience. During Soar, students will receive access to resources and be able to familiarize themselves with the Cal Poly campus and surrounding San Luis Obispo community. Activities that take place during Soar include: a campus tour, learning how to use the My CalPoly Portal, Plan A Student Schedule, and participate in activities that help students practice managing their time. Students and supporters will have the opportunity to explore the surrounding San Luis Obispo community during Explore SLO. During this time students will be able to explore downtown, have lunch or dinner, and interact with the San Luis Obispo community. The current Soar session dates are available, and can be found on the New Student Programs website. 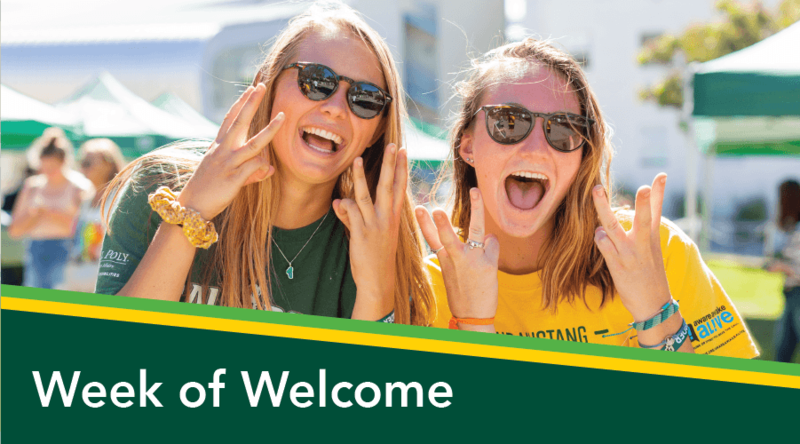 SAN LUIS OBISPO, CA --- In mid-September, new students will finish their transition into Cal Poly this Fall with the final orientation program, Week of Welcome. WOW, is a week long orientation event to help students acclimate to their new environment before their first week of classes take place. WOW is a balance between exploring campus, the surrounding San Luis Obispo community, and learning about the transitions that will take place during their time at Cal Poly. Each day the WOW groups will partake in a variety of activities including: awareness presentations, Mustang Way to Success seminars, and discussions on bystander intervention and college culture. WOW groups will also explore SLO by kayaking, hiking, going to the beach, eating in downtown San Luis Obispo, and giving back to their community during Service Days. 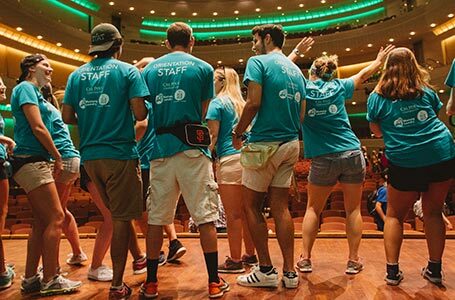 Each WOW group is lead by two Orientation Leaders, who have trained for more than 40 hours over Spring Quarter. These groups have 15-20 new students, and are formed based on residence hall. This organization method introduces WOWies to other new students, and helps them form a support system in their residence hall. As tradition each WOW group has a number and a theme, and you will often see WOW leaders wearing matching t-shirts and carrying signs to represent their group. By the end of WOW, the goal is for each student to feel like they have the tools and resources they need to adapt to their new lives at Cal Poly.